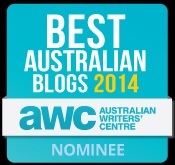 Each year the Australian Writers’ Centre holds the Best Australian Blogs competition and they are now open for 2014 entries. Food: this is new for this year, so foodies celebrate! Provided you are Australian and fall into the blog categories above, anyone can enter. This is the competition’s fourth year, and the prizes just seem to be getting better! This year Trafalgar is donating some incredible travel prizes, and Random House continue their support of the competition with both prize money, books and mentoring. Of course there’s also Australian Writers’ Centre courses up for grabs too (which I can highly recommend). You can find the full competition details here.